Conventional Plaster is usually a three coat plaster system. It uses wood lath, or gypsum rock lath, masonry, or wire mesh for a plaster base. Wire mesh or masonry is most common in new work. 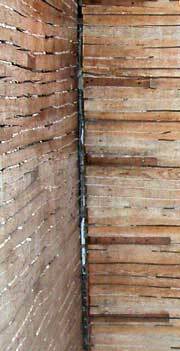 Wood lath is no longer used except in some historical restorations. Properly done, conventional plaster is even more solid than a veneer plaster system. 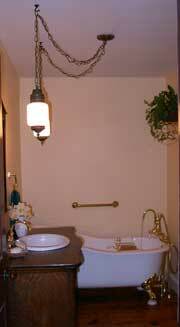 Because of the higher cost, it is seldom called for in residential applications. However, we often do conventional plastering in remodeling and restoration of older institutional buildings, like the old stone buildings at Connecticut College. Additionally, we use this system for curved surfaces in some residential applications. We can achieve tighter radiuses than sheet rock could ever be bent to. Since lathers (tradesmen who strictly installed lath systems) are no longer very common, we install our own wire mesh with special corrosion resistant screw fasteners. 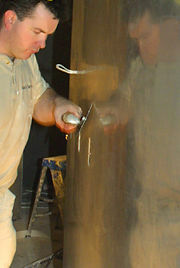 The first coat in a conventional system is called the scratch coat. The scratch coat is mixed with less sand than the brown coat that follows it. Thus it is a bit stronger and acts as a base coat for the much thicker brown coat. The scratch coat over the wire serves to "key" the plaster into the diamond shaped holes or ribs of the mesh. Sufficient plaster is troweled over the wire to ensure that the mesh is entirely covered, while pushing the wet mix through the holes forming a mechanical bond. A rake-like tool called a scarifier is run over the wet coat. The scarifier leaves grooves to allow the subsequent brown coat to mechanically bond to the scratch coat. A plaster ground (or screed) is used to level the brown coat and control thickness. There are a few different methods of setting grounds, but regardless of which is used, they ensure the wall will be perfectly flat and plumb. The framing members can be way out of alignment with each other, yet the results will still be perfect, because the plaster thickness will vary as needed. The nominal thickness of the scratch and brown will be about 5/8 inch. Once the brown coat is set, we prefer to wait at least a day before putting on the 1/8 inch thick finish coat. We prefer to use only the heavier 3.4 lb galvanized wire mesh with USG’s Red Top Wood Fiber Plaster™; job mixed with clean mason's sand, for the scratch and brown coats. For the finish, we use USG Structo-gauge Super Strength™ finish plaster; job mix with wet lime. The heavier mesh provides a more rigid base. The wood fiber plaster has shreds of wood fiber in the mix, greatly strengthening the scratch and brown coats. Structo-gauge makes for a smooth hard surface with superior strength and resistance to cracking from the elasticity of the lime component. If you rap your fist on a wall that we have applied conventional plaster to, you would think it was made of concrete block.